Thermal management has assumed a critical role in the design and development of electronic devices, power generation modules, and waste energy harvesting techniques. Many of these modern technologies are based on materials with structures much smaller than one micron. In these applications, performance depends vitally on the thermal transport across material interfaces. Therefore, the ability to engineer this thermal boundary conductance (TBC) represents a major path forward in thermal mitigation and management in a wide array of technologies. At the level of the individual interfaces, thermal transport is affected by the atomic and nano-structures around the interface. Roughness, defects, chemical mixing, and other imperfections can lead to changes in the rate of interfacial heat flow. In the past few years, engineering the TBC across interfaces has focused on manipulating the chemical bond between two materials, which has demonstrated potential as a path forward for bi-directionally tuning heat transfer in nanostructures. In this talk, I will discuss several recent efforts in which we have used molecules and molecular chemistry as a mean to manipulate the TBC across interfaces. I will focus on three specific experimental efforts in which we have demonstrated the ability to either reduce, or enhance, the TBC, as measured with our pump-probe time-domain thermorefelctance (TDTR) set up at the University of Virginia. The major advances in each of these three efforts are focused on using fluorinated systems, and the carbon-fluorine bond, to resolve novel nanoscale scattering events in interfacial molecular systems. In the first part of the talk, I will present our recent work studying the role of phosphonic acids (PAs) on manipulating heat transfer across metal/sapphire interfaces. In the second part of my talk, I will focus on TBC across functionalized graphene interfaces. In the final part of this talk, I will discuss our recent effects on understanding the mechanical and thermal contacts at solid/liquid interfaces. Patrick is an Assistant Professor in the Department of Mechanical and Aerospace Engineering at the University of Virginia. Patrick joined the faculty at U.Va. in 2011 after a three year Harry S. Truman Postdoctoral appointment at Sandia National Laboratories in Albuquerque, NM. His research interests encompass both experimental and theoretical efforts in nanoscale thermal transport and short-pulsed interactions with solids. 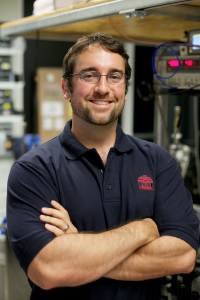 Patrick has authored or co-authored 88 refereed journal publications in the areas of photonic, electronic, and/or phononic transport on the nanoscale and is a recipient of Young Investigator Awards from the Office of Naval Research and the Air Force Office of Scientific Research.